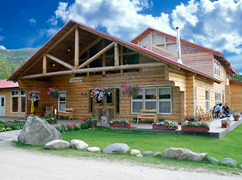 The Denali Backcountry Lodge, located at the end of the 95 mile Park Road in Kantishna, offers you a complete Denali Park vacation experience -- and surprising comfort. Winding through the Alaska Range, deep into the heart of the park, the "Park Road" offers opportunities to see Denali's famed wildlife: Grizzlies, Caribou, Moose, Dall Sheep, Wolves, and Eagles. And, should the weather smile on you, above all of it towers Mt. McKinley itself, the highest point in North America. At the very end of the Denali Park road, past Wonder Lake, you'll find a unique enclave in the park known as Kantishna, home to Denali Backcountry Lodge. The lodge offers thirty comfortably appointed cedar cabins. Each cabin has two beds, electricity, flush toilets, running hot water, a sink and shower - surprising luxuries in the middle of the wilderness! Dining and lounge areas are found in our spacious two-story lodge. When it comes to meals, you'll be treated with great food prepared by our chefs and hospitality staff. Hot breakfast is served buffet style. For lunch, a hot soup and sandwich buffet is served in the lodge, but most guests pack up a lunch for their day's explorations. At the end of the day, everyone is invited to join our naturalist guides for gourmet appetizers and a recap of the day. Evening dinners are served family style in the lodge. All of our food is fresh, hearty, and wholesome. Our informal bar service features draft and bottled beer, wine, and cordials. Individual arrival at Denali Village. Guests meet at the Alaska Railroad depot around 1:15 pm and our private bus departs at 1:45 pm, timed to connect with the train arrival from Fairbanks. If you arrive via rail from Anchorage we are happy to provide pre-reserved hotel accommodation for you to overnight near the park entrance. The famous Denali National Park road offers your best chance for observing the wildlife that makes the Denali area so unforgettable. In the comfort of our specially permitted private vehicles, it is not uncommon to witness astounding natural displays. During your journey, our experienced bus drivers share their knowledge of the park and offer wildlife searching tips to help you locate the park's animals and birds. 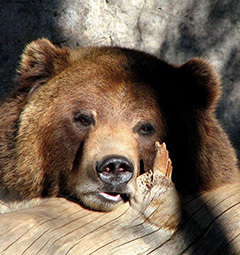 Whether through binoculars or with the naked eye, you may be fortunate enough to see a grizzly sow nursing her first-year cubs; a band of bull caribou with huge racks browsing along the tundra; or Dall sheep on the high mountain ridges, playing and frolicking as if they knew they were being observed. Each trip to and from the lodge is a spirited and suspenseful event, loaded with anticipation. Although Denali National Park is a wilderness - and wildlife events don't occur on a schedule - the scenery is always superlative, and it's rare that a trip doesn't produce numerous wildlife sightings. The spectacular trip to the lodge takes around six hours, depending on weather and wildlife sightings. Your driver will provide delicious snacks and beverages during the breaks before you eat dinner at the lodge. In the evening take advantage of the long daylight hours to stroll around the area or participate in the interpretive programs about Alaska and its wildlife by our staff and many featured guest speakers. Overnight: Denali Backcountry Lodge. Each day we offer naturalist-led programs, guided hikes and walks, gold panning or other afternoon activities, naturalist presentations, mountain bikes, and slide shows. 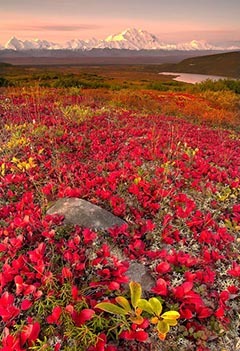 We encourage our guests to explore the natural communities central to Denali -- to understand how this unique and fragile environment flourishes in spite of the harsh sub-Arctic climate. During lodge activities our staff will introduce you to the subtly spectacular natural and cultural histories of the adjacent boreal forest and tundra. Two outdoor gazebos near Moose Creek are great places to relax, and a suspended footbridge spanning the creek offers access to many hiking trails. When Denali itself is "out," guests can hike or shuttle to spectacular viewing areas, where even the novice can end up with truly stunning photographic results. When the mountain does grace us with an appearance, we are overwhelmed by the awesome Wickersham Wall, reputed to be the largest vertical surface on earth. Depending on weather and space availability, there may be flightseeing opportunities while staying at the lodge (not included). Every member of our first rate staff looks forward to getting to know you both professionally and personally. Overnight: Denali Backcountry Lodge. The private bus departs from the lodge at 6:45 am and arrives at the Denali Park Entrance and the railroad station around 11:30 am. This schedule allows for southbound travel arrangements from Fairbanks by train on the day of arrival at the lodge, and for railroad departures to Talkeetna and Anchorage on the day of departure from the lodge.